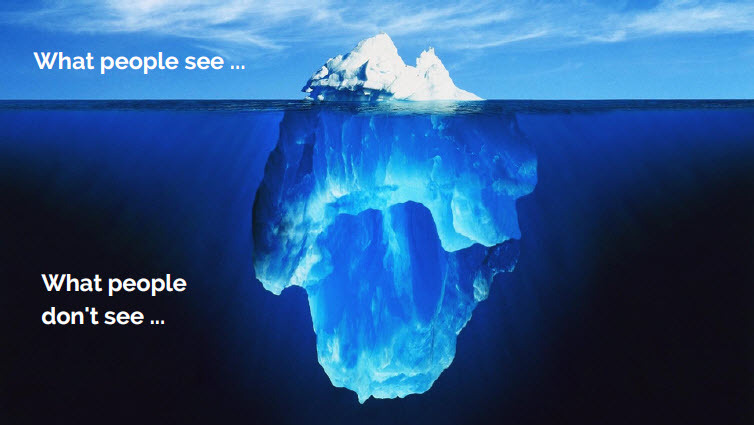 Yesterday, while learning about hypnosis, I was introduced to a theory by Freud called the “Iceberg Theory”. It is a theory about the conscious VS the unconscious mind. It is pretty fascinating stuff! However, when I read it I couldn’t help but think about Facebook. Whether its a post about a business, a personal achievement, a vacation or even a news article, all we really see is what is on the surface. We rarely, if ever get to see the rest of the story. For simplicity sake let’s call this the Facebook Theory. Facebook has become an amazing tool for all of us to become more connected, yet in many ways, our society has become more disconnected than ever. Instead of picking up the phone to say hello and ask about the amazing trip that our friend just went on, we click “like” and rarely ask them about their experience. We read news articles and immediately believe the story or take sides, then persecute any of our “friends” that don’t agree with us. Rarely do we take a few minutes to consider the other person’s point of view and why they may feel the way they do. We see a person advertise their business or services and immediately accept or reject them without ever asking them what inspired them to begin their business in the first place or how we can help them succeed. Today I’d like to challenge you to begin the process of reconnecting with your “friends”. It’s time to stop accepting what’s on the surface and go deeper. Really start to “connect”. Ask more questions, send more personal messages, pick up the phone and have a conversation with your old friend. Go deeper, learn to see what’s beneath the surface. Quit generalizing by lumping all people of one belief into one category. Learn to accept that your opinion is not the only “right” way of seeing things. Celebrate each others accomplishments and TRULY be present and available for your friends in a time of need. Well said Kevin,I personally do not like the Facebook type of connect. I have an account though but only few times in a year I open it. No matter there are so many messages waiting for me. I completely agree to your views. I am rather very happy with WP. I find good friends here. But it should not slowly turn into another FB.